Volvo Ocean Race CEO Knut Frostad discussing the situation and priorities following the grounding of Team Vestas Wind on the Cargados Carajos Shoals, Mauritius, in the Indian Ocean. Azzam team mates Phil Harmer and Luke Parkinson give their own, unique description of the lead-up to the storm. Warnings of tropical cyclone prompt the race teams to get ready to batten down the hatches, but the reality turns out to be something altogether different. ...Cy Thompson prepares his Laser class boat for sailing competition Monday in Veracruz, Mexico. Coast Guard saves 62-year-old from sailboat | WAVY-TV: "WILMINGTON, N.C. (WAVY) – A 62-year-old man was rescued from a sailboat Thanksgiving morning about 100 miles east of Kill Devil Hills...."
Abu Dhabi thankful. Dongfeng, not so much. Meet one of ocean racing's toughest characters. Breaking a rib would stop most people from starting the hardest sailing race, but not Tony Rae. Tom Linskey: Where is he now? While Linskey continues to sail, his competitive energy has been replaced by a charitable focus. Here is his update originally published in BoatU. An outstanding contribution to local sailing has earned a Shropshire volunteer a prestigious award presented to her by The Princess Royal. Undies, Boxers, Reggies - Underwear have many different names, and that's just on this boat. What do you call yours? Danish sailor Jens Dolmer has his own farm back home... and his love for animals came to life in the Indian Ocean, when an albatross paid a visit to Team Brunel. Qatari sailors practise ahead of the 47th World Military Sailing Championship, which got off to a colourful start at Katara Beach in Doha yesterday. 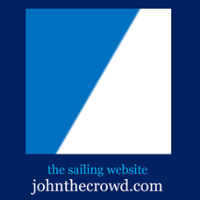 Is Annapolis really the country's sailing capital? Leg 2 is proving tough on the sailors, and the boats. Team Brunel and Abu Dhabi Ocean Racing affect small repairs, and give an explanation to how confusing this leg is turning out to be, navigationally. A ripped A3 puts Abu Dhabi Ocean Racing in a tough situation... But nothing a quick fix cannot solve. Check out how Ian Walker's guys got back in the race. Jump aboard Team Alvimedica for the start of Leg 2. A privileged perspective on the rocky start start, in which the crew share their expectations for this Leg amid some fast sailing. One day into Leg 2 and the boats can still see each other. The fast speeds would make any of us be cautious, but for these sailors, it only makes them compete more fiercely, if that's even possible. And they're off! 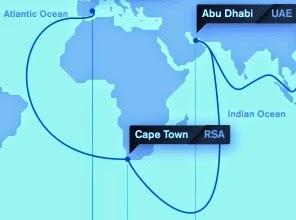 The fleet has left Cape Town on Leg 2 to Abu Dhabi. A maelstrom of a start, some unexpected conditions, and a check-in with the new guy in the fleet, Rob Greenhalgh. “We supported the Rescue Kite concept and have sponsored its use in the Volvo Ocean Race to help raise its profile and encourage its wider use. Leg 2 Start Video Highlights | Volvo Ocean Race 2014-15: A snapshot of the action as the fleet of Volvo Ocean 65s set out on Leg 2, from Cape Town to Abu Dhabi. Twitter · Facebook. The podium for the Route du Rhum Class40 category was completed on Wednesday with Spain's Alex Pella celebrating first place. Volvo Ocean Race 2014-15, Leg 2, Abu Dhabi Bound!